With the recent DVD & Blu-Ray release of Lance Armstrong biopic The Program, what better time is there to enjoy a pedal down memory lane and document the best movies about cycling ever made. Jonny Lee Miller depicts the enigmatic Scottish cyclist Graeme Obree in this 2006 Biopic. Obree twice held the World Hour Record and was World Champion in the 4000m pursuit in 1993 & 1995. Obree suffers from severe depression and the film documents his troubles with the various cycling authorities other the design of his 'Old Faithful' bicycle which he built himself, partially from parts of a washing machine. Co-starring Brian Cox, the movie was relatively well received at the time and continues to inspire to this day. It was the original intention of director Alex Gibney to film The Road Back, documenting the triumphant return of renowned cyclist Lance Armstrong after a four year retirement. After the 2012 doping investigation,the subsequent lifetime ban and stripping of his seven Tour De France titles, the project was reluctantly shelved. It was Armstrong himself who returned to Gibney in 2013 to complete a new project, The Armstrong Lie. The film spans the career highs and lows of Armstrong and remains an engaging and absorbing tale of a modern fall from grace. Nominated for two Oscars at the 76th Academy Awards, one for Best Animated Feature & for Best Original Song, this Sylvain Chomet directed masterpiece is famous for its unique animation and enduring nostalgic story. Champion is a young boy who lives with his Grandmother, he lives a solitary existence until he receives a bicycle as a gift. Champion is later kidnapped during his first major race and it is up to his unconventional group of friends to rescue him. This directorial debut from legendary French film-maker Jacques Tati is the story of an incompetent postman in rural France attempting to speed up his delivery process. Essentially a slapstick comedy, the film utilises visual comedy to demonstrated the ineptitude of the protagonist, played by Tati himself. Inspired by a cocktail of wine and new technology, Tati takes us on a journey through a French community where he is frequently distracted by the local inhabitants, leading to amusing situations. In one instance Tati accidently joins an amateur bike ride only to be toppled into a nearby river for his trouble. Shot largely in the village of Sainte-Severe-Sur-Indre and its surroundings, the movie was filmed in an early colour film process entitled 'Thomson-color, only to be completed in black and white for financial reasons. 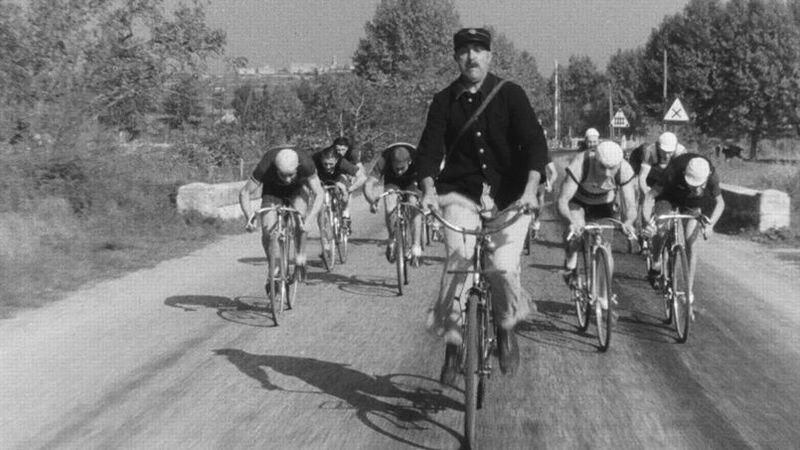 The finest bicycle-centric movie ever made. Period. No list of bike related movies should be without De Sica's neorealism masterpiece and probably few 'greatest films ever' lists fail to mention it around the top ten. Simply put Bicycle Thieves is the archetypal Italian movie and the finest of the norealism movement. The story centres around Lamberto Maggiroanni's character Antonio, a down on his luck father looking for his stolen bicycle with the aid of his son Bruno (Enzo Staiola). The fruitless endeavour is made all the more profound as Antonio needs the bike for work to support his family. The Government's ambition for Britain to become a 'cycling nation' has been given an added boost with the introduction of £5m funding to the Bikeability Plus initiative. The initiative was introduced to encourage and educate families about the many benefits of safe cycling. One aspect of the campaign is to promote cycling in disadvantaged areas to children and adults who may not be otherwise cycle. Since the initial pilot projects were laid out last year nearly 20,000 participants have taken part in the campaign with the intention of an additional 200,000 set to be reached thanks to the funding boost. According to the Department for Transport the number of children cycling to school at least once a week after completing a Bikeability Plus course has more than doubled to approximately 10%. The new training scheme will be rolled out from September 2016 when schools will be able to offer courses to their students. Cycling minister Mr Robert Goodwill said: “We want Britain to become a cycling nation and Bikeability Plus will be important in getting more children cycling safely and with confidence. The DfT is also supporting £114 million for eight cities in England who are ambitiously pursuing cycling infrastructure changes in order to become flagship locations for the Governments future intentions. Bristol, Cambridge, Leeds, Birmingham, Norwich, Newcastle and Oxford have all submitted their bids in order to secure the funding.